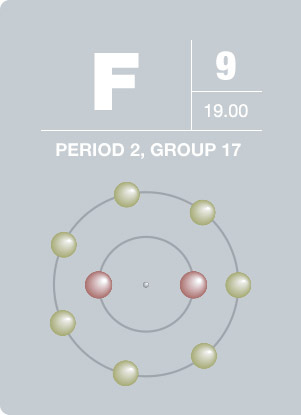 For fluoropolymers which may be sensitive to prolonged X-ray exposure, acquire C1s and F1s regions first, before moving onto survey and/or other elemental regions. Should see F KLL Auger peak as (binding energy=832eV and 858eV) confirmatory signal, except for very low concentrations. F1s peak shapes are normally symmetrical. Fluorine tends to induce large chemical shifts in other elements, but within a given class of fluorine compounds (metal fluoride or organic fluorine), the shifts in the F1s peak are small. The chemical shift between CF2 and CF3 is large (3eV) in the C1s region, for example, but the shift in the F1s region for the same chemical groups is negligible. Organic fluorine species are commonly observed surface contaminants. G. Agricola first described fluorine in the form of fluorspar (calcium fluoride) in 1529, but because of its highly reactive nature it took until 1886 for fluorine to be isolated by H. Moissan. This feat earned Moissan the Nobel Prize in Chemistry in 1906. Commercial production of fluorine was not needed until the Manhattan Project, in which uranium hexafluoride was used to separate the isotopes U-235 and U-238. Today, fluorine is found in such materials as Teflon and Freon. Fluorine is the most reactive and electronegative of all elements, and in the presence of water, will form hydrofluoric acid, an extremely dangerous compound.